Happy 4th of July! Just wanted to pop in and share a few of my patriotic looks from this past week. I admittedly don’t own a ton of red, but after a further inspection of my closet and a lucky eBay purchase, I found I had a few items that I could work in different shades of red, white and blue. 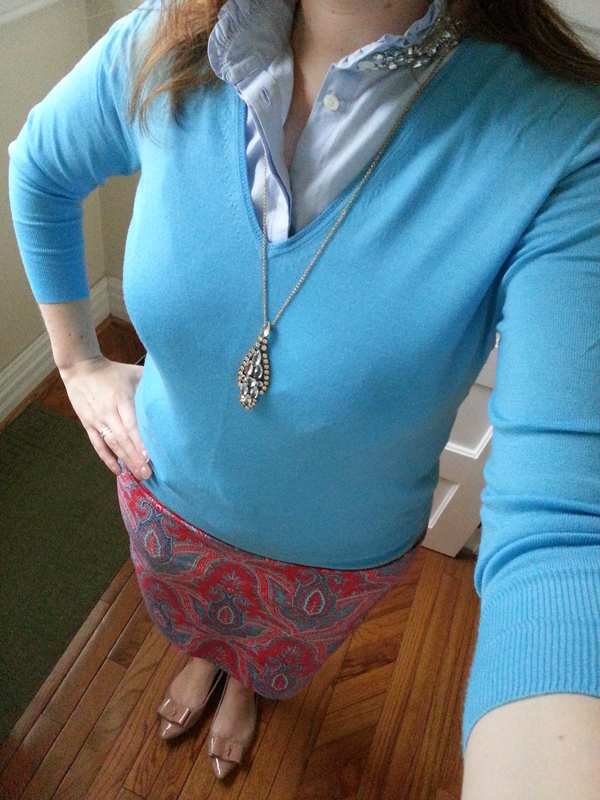 I recently received the J.Crew pencil skirt in Raj Paisley via eBay and was surprised to see that it was mostly made up of a blue and red pattern (I thought there was more purple in it…but that must be the mixing of the two colors from far away). I originally had it paired with just the oxford Tilda blouse but found this J.Crew Lightweight Merino v-neck sweater in Monaco Blue in my closet and it was a perfect match! I admittedly don’t wear a lot of blue that isn’t navy or aqua hued, so I was happy to find another outfit combination for this sweater. I opted for neutral shoes since I had a lot of color in the outfit itself. 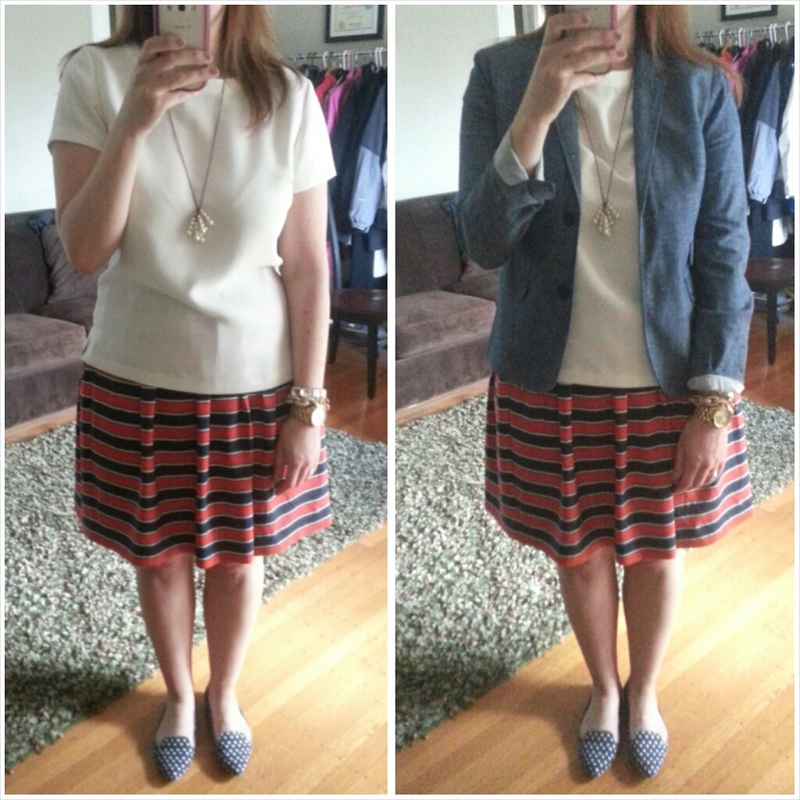 Next up, the J.Crew Gondola Stripe skirt. I have a lot of trouble deciding on tops for this skirt – the skirt hits higher on my waist so anything tucked in usually makes my torso look really short and my chest look really big. On a whim, I tried a blousy top and really liked the look, which I finished off with a chambray blazer. I’ve seen this skirt styled with polka dots and liked the look so I thought I would add that in via my loafers. 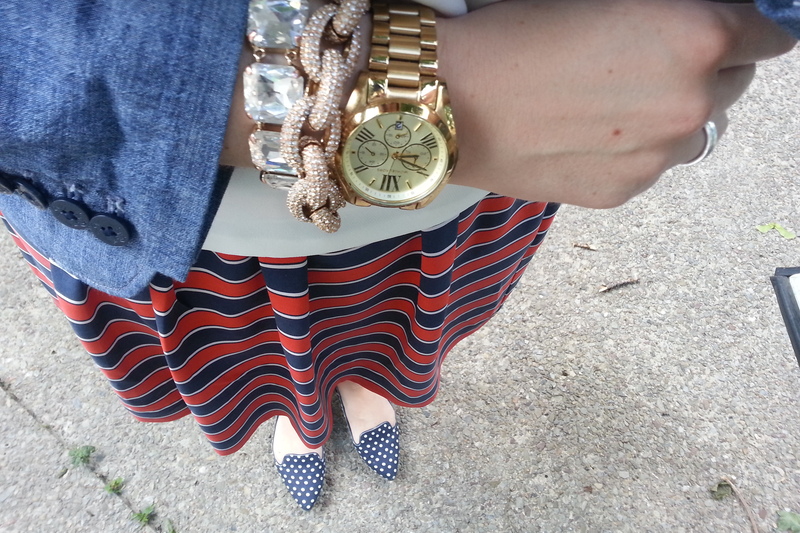 Some gold jewelry and a simple necklace and I have to say this was a pretty solid patriotic effort in my opinion! After a very busy week we actually have a quiet 4th planned but fireworks are always in the plan! I am usually not one to pair red, white and blue but it is always fun to do so around the 4th of July! So what do you think, are these patriotic enough? Would love to hear what you think and thanks for visiting!